Anchor Systems (International) Ltd (ASIL) were approached by ES Associates to design and supply a foundation for a permanent/temporary structure. 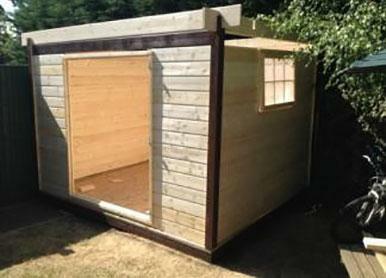 The Log Cabin is 3.1m x 2.4m structure in plan and weighs approximately 750Kg dead weight. The structure is designed to withstand snow loading and other associated hazardous conditions. The maximum load when the structure is occupied with storage components is approximately 1250Kg. The log cabin is made up of dense treated 28mm thick timber panels. The client required the foundations to be installed within a short period of time as access to the build area was increasingly congested and difficult to maintain. The site had stringent requirements for minimising environmental impact and limiting waste on site with regard to trades employed. Wet trades were discounted as an option on this site. ASIL were engaged to supply the correct solution for the project based on the stringent site requirements. Once the interface plates for the timber foundation were designed and supplied with the patented anchor post solution; the anchor posts were positioned and driven into the ground in 45 mins to line and level. Silver Contracting used ASIL’s specialist hand held installation equipment designed to be portable expressly for hard access sites. The foundation timber was laid and secured on the anchor posts in a further 2hrs. The assembly and fit out of the log cabin took a total of 4 days with a 2 person crew. ASIL understood the nature of the site and exacting client’s requirements. The anchor post foundation solution offers up to a 50 year design life, with the opportunity of removing the foundations just as easily as the installation process should the need arise, Environmental impact is deemed to be negligible.